Origin: Japan late 1790'S. Eisui. 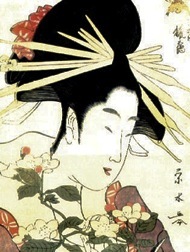 A Yoshiwara courtesan arranging flowers. Can be seen at the Art Institute of Chicago size: 29x38x2 Done with a black lacquer frame and liner. Background glass is gray iridescent. 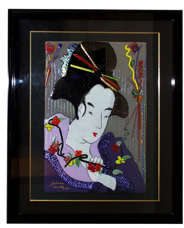 Faces and kimono are done in various colors and dichroic glass. Highlights and features are done in enamel.